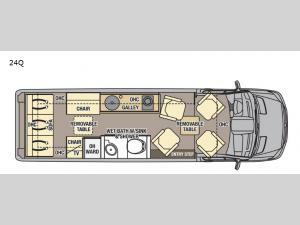 This Galleria Class B diesel motorhome is a great couple's coach! You will enjoy traveling to all of your favorite places in this model which features everything you need to spend time on the road comfortably! With two additional swivel chairs and a removable table behind the cab seats, you have a wonderful spot to enjoy your meals or a board game together. There is also a galley kitchen where you can easily prepare light meals or snacks on the cooktop, and you will find ample storage for your dishes and things in the overhead cabinets. You will find sleeping and relaxing accommodations in the rear with the power sofa that can transform into a bed for two at night. Mercedes got in on the action and combined with Coachmen to create the Galleria Class B diesel motorhome with the utmost quality. With its lane assist sensor, collision avoidance indicator, and back-up camera, the Galleria creates a safe haven for you to tour the country in, and the heated swivel seats in the cab will be a joy to have when you make early morning trips to and from the campground. You will also appreciate the inclusion of the Firefly MultiPlex system which gives you the ability to control various functions throughout the Galleria with just the click of a button at the central control panel.